Sounds like the weekend sortie into the ocean provided a positive account of how the board rides! Allright! Cowa-flexit! Out for now. . . Rob and Steve w Rob's new ride! 2 Comments on "Rob’s new ride"
It goes insane. Insane. So responsive in turns it blows my mind and the speed is unreal. 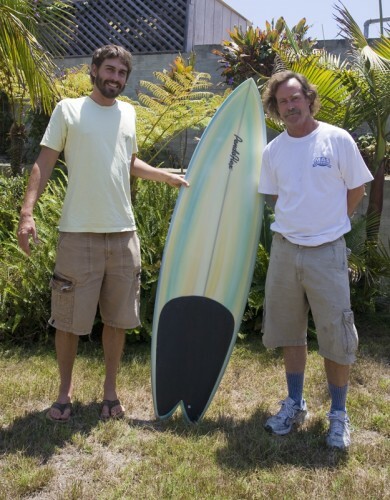 Perfect rocker, rails and plan shape + with the pendo engine = a favorite board. Hey, Rob, thanks for your feedback, much appreciated! So stoked that you love your new board and are getting some fun waves. We look forward to surfing with you, soon. Cowa-flexit!